They found a home in the Wellesley Hills Unitarian Church. The minister while Hayward was in high school was James Luther Adams, a man who would become a lifelong friend, mentor, and second father. 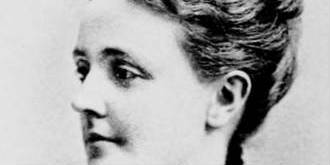 Adams emphasized that all parts of culture interfaced with and must come under the lens of religion, including and especially political life. Hayward reports: “Mr. Adams initiated me into the drama of politics and the necessity for citizen participation in social action. While the congregation grumbled about his politics, they greatly honored him for his wisdom, his kindness, his intellect, and his pastoral warmth.” In addition to influencing Hayward’s emerging social ethical views, Adams was instrumental in shaping his love for the arts. “Adams invited me to sing in his church choir. He could not have known then that he set in motion, by recordings and song, my life long devotion to classical music.” Adams also introduced Hayward to literature, reading Shakespeare and Dante with him, and helping him to begin to make the connection between the arts and religion. Despite the disillusionment that he felt with religion during his philosophy major at Harvard, Hayward did agree to go to Meadville, although he says he had little intention of becoming a minister. Nevertheless, he moved to Chicago to attend Meadville Theological School and the University of Chicago Divinity School after receiving his A.B. at Harvard in 1940. At Navy chaplain school, Williamsburg, VA, 1943. During Hayward’s time, the faculty at Meadville consisted of Sydney Snow, James Luther Adams, and Charles Lyttle. Hayward likened Snow to Ralph Waldo Emerson—”with a perfect Harvard accent and a New Englander to the tips of his fingers.” Lyttle was a church historian and a humanist, with whom Hayward used to wrangle. Dr. Lyttle would open class with a prayer to some spirit or other. Hayward remembered asking him why didn’t he simply pray to God and get it over with? His favorite professor at the University of Chicago was the German church historian Wilhelm Pauck, a liberal Lutheran who had known Paul Tillich in Germany, and who was a scholar of church history and the history of theology. Pauck convinced Hayward to take Calvin and Luther seriously, even though Pauck and Hayward fought about Unitarianism. And of course there was James Luther Adams. His teaching style was dramatically challenging, perfectly choreographed, and constantly in motion. In addition to his teaching and continued mentoring, Adams lent him mimeographed copies of his translations of papers by Paul Tillich, the great philosophical theologian of culture, before they were published, allowing Hayward to assist him in perfecting the English. Especially influential in introducing Tillich’s thought into the mainstream of American intellectual life was Adams’s translation of Tillich’s The Protestant Era published in 1948. This early introduction to Tillich would prove to have lasting significance for the course of Hayward’s thought. Hayward began to move in his own direction. During his B.D. studies he read Thomas Mann’s Joseph and His Brothers, in which Mann tells the biblical story of Joseph. Here Hayward first realized the enormous dramatic possibilities of biblical narrative. He arrived at the notion that a work of mythology provides ideal types for an evolving culture; he also came to the realization that myths form a kind of skeleton structure that may have many different kinds of flesh put on them, but are nevertheless a continuity of history important for the establishment of civilization. 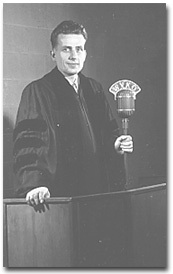 Hayward pictured in 1949, shortly after his installation as minister of the First Unitarian Church in Columbus, Ohio. Hayward began to take the Bible more seriously as a reservoir of these kinds of myths, particularly the Old Testament, which he felt was richer dramatically than the New Testament. He also began to reassess his former approach to Greek thought; he became interested in the myths and literature of the Greeks, as well as their philosophy. 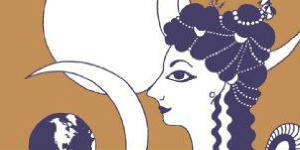 He began to see Jerusalem and Athens as the two fountainheads of Western culture, a typology that has stayed with him. The world was in the midst of a tumultuous time while Hayward was in seminary. Meadville students heard from Adams about his experiences in Nazi Germany in the late 1930s and about the emerging German dictatorship. By the time Hayward received his B.D. in 1943, the country was at war. 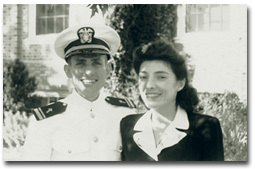 Three months after he and Muriel were married he was in uniform and eventually was sent by the Navy to the Marines. Hayward was assigned to a combat supply regiment that was responsible for going in after the first wave of an invasion and building supply dumps. In this regiment were several all black companies which served as cargo handlers. Hayward reports that one of his warmest memories of military service was leading worship services in the still segregated barracks of these black Marines. 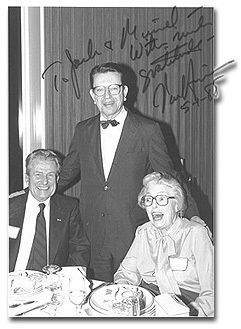 Jack and Muriel Hayward with Senator Paul Simon, their candidate for President of the United States. In November 1945 Hayward left the Navy and returned to the University of Chicago Divinity School under the GI bill. He studied under Wilhelm Pauck, who was his dissertation advisor, worked on the philosophy of Alfred North Whitehead under Charles Hartshorne, and finished his studies under the direction of Bernard Loomer while Pauck was on sabbatical. He finished his Ph.D. in theology in two years, writing a dissertation on myth and art using Tillich and Whitehead as primary sources for The Theology and Philosophy of Mythical Symbolism. 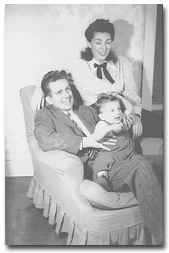 Jack and Muriel Hayward with son Peter, 1948. 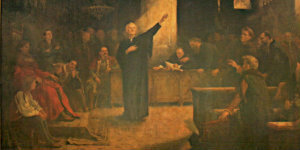 While in Columbus, Hayward attended the first meeting of Prairie Group, a Unitarian ministerial study group founded by several Unitarian ministers, including James Luther Adams, Leslie Pennington, and Robert Raible. Prairie Group is patterned after the Greenfield Group that meets in New England, and its purpose, like that of the Greenfield Group, is to further in the Midwest the learning of Unitarian—and later Unitarian Universalist—ministers. Members choose a topic every year on which they agree to study, prepare papers, and discuss the following year. Hayward served as the scribe of Prairie Group for twenty years. Prairie Group has been the locus of a large number of his scholarly papers, and Hayward has had a major impact on the development of the group over the years. 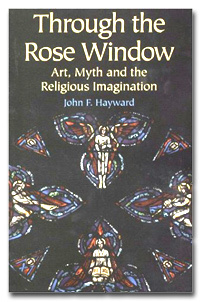 Hayward came to the Divinity School in 1951 as assistant professor of religion and art, and taught courses in the visual arts, myth theory, and theology. 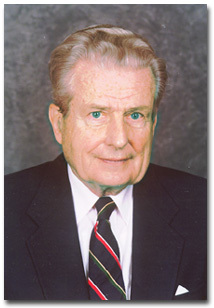 Wallace Robbins was president of Meadville at that time, and Robbins, Hayward, and Adams constituted the Unitarians on the Federated Theological Faculty (FTF). The FTF was a consortium of four theological schools, including Meadville, the University of Chicago Divinity School, Disciples Divinity House, and Chicago Theological Seminary. These schools shared one faculty made up of representatives from each denomination, and students of the respective schools were awarded their degrees under this common faculty. After Adams left for Harvard Divinity School in 1957, Hayward was the only full-time Unitarian faculty member on the FTF, and he reports that most of his classes were made up of Divinity School students, with few Meadville students. While he greatly enjoyed his work at the Divinity School and the ripe theological environment that existed amongst its faculty there, he says there was a great deal of tension with Meadville students, who thought he was too much on the Divinity School’s side and not enough on theirs. In 1960, Chicago Theological Seminary (CTS) insisted that a portion of the requirements for their degree be solely under their control, a move that contradicted the constitution of the FTF. Believing in the unity of Unitarianism with the body of Protestantism, Hayward, Wallace Robbins, Sidney Mead, and others tried to hold it together. Despite this effort, CTS’s agitation caused the FTF to fall apart. In the aftermath, what had been the faculty of FTF went in separate directions, with some staying at the Divinity School and others accepting positions at the seminaries. Sidney Mead, then president of Meadville, offered Hayward an associate professorship in philosophical theology, which Hayward accepted, and he taught at Meadville from 1960 until 1968. 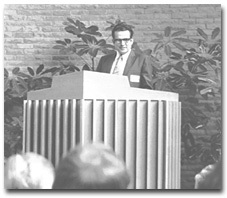 Hayward addressing the Unitarian Conference in Indianapolis, September 1973. Hayward had planned on spending the rest of his career at Meadville despite frustrations with aspects of his work there. One of his guest preaching excursions was to the Unitarian Fellowship in Carbondale, Illinois. An old friend from Hayward’s years in Columbus, Ohio, Milton McLean, visited in the congregation. McLean had been called out of retirement by Southern Illinois University in Carbondale to start a religious studies program. He told Hayward that the university was looking for a director for the program, which would eventually turn into a department with a chairman, and asked Hayward if he would consider the job. McLean drove Hayward to the train station to catch the train for the five hour trip back to Chicago, and asked Hayward to think over the possibility. Hayward says that never before or since has he thought of one thing for five hours. By the time he arrived in Chicago, he had made up his mind to throw his hat in the ring. A major influence of his years in Carbondale was the Carbondale Unitarian Fellowship. 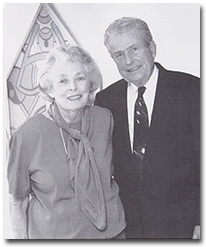 Jack and Muriel joined the fellowship soon after arriving in Carbondale and both were involved for many years until her death in 2001. 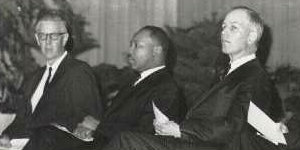 He was named “honorary minister” for his long involvement and part-time ministerial assistance. He has preached there many times over the last thirty years, and the experience has kept him grounded in congregational life after leaving theological education for university teaching. This long-term ministry has given him an opportunity to utilize in a congregational setting many of the ideas he developed earlier in his career. — by Kenneth A. Olliff, abridged from: “John F. Hayward: A Biographical Sketch,” in Kenneth A. Olliff, Renewing Religious Liberalism: John F. Hayward and the Crisis of Theology in the Liberal Church. (D. Min. dissertation, Meadville Lombard Theological School, Chicago, IL, 2000). As the Haywards are fond of saying, almost in unison, “We like symphony, we like opera, but we love chamber music.” They explain that from the listener’s point of view they enjoy chamber music because they can hear what’s going on, they can listen to each instrument. But it is the democratic nature of the music which clearly brings them greatest pleasure. Chamber musicians, unlike orchestral musicians, have no conductor and must rely on each other, working closely together and finding and making great music from their compromises. Mr. Hayward explains, “By listening to each other they find new ways of interpreting pieces they’ve played for years.” The result of this democratic endeavor is that no matter how many times you hear a piece of chamber music you hear it played differently by each ensemble of musicians. Much to their delight, the Haywards discovered that the Marlboro Chamber Music Festival, located in Vermont, had taken the democratic aspect of chamber music one step further by integrating it into the educational process. Each summer the most famous chamber musicians in the world come to this small Vermont town to play, not just with each other, but with younger talented musicians. The Marlboro twist is that the more experienced musicians do not formally serve as teachers. Instead, the musicians learn from each other as they explore and perform the music. For many years the Haywards have philanthropically supported chamber music, notably through the endowment of a Marlboro scholarship. But it wasn’t until the early eighties, after hosting several chamber music political fundraisers, that they began to pursue the dream of building a chamber music scene in Southern Illinois. That dream became a reality when, in cooperation with SlUC’s School of Music, they established the Southern Illinois Chamber Music Society. The society, which recently completed its fourth season, has what Muriel Hayward calls “the Marlboro Connection.” Young musicians are attracted to SIUC through scholarships funded by the Southern Illinois Chamber Music Society. Once here they work with music professors from the university and perform with them in a series of recitals performed in the intimate environment of the Small Business Incubator atrium. The Haywards say the society has flourished because of the support of the School of Music faculty and directors, current and retired, and a small but loyal and enthusiastic following. With its reputation established, the society has now turned its focus to building an endowment that will ensure its future. To that end, the Haywards have offered to match up to $50,000 in gifts received for the endowment. They have already matched close to $20,000, and they believe that before the fundraising is completed the society will have an endowment of several hundred thousand dollars. For Jack, retired chair of the religious studies department, and Muriel, there could be no better legacy than a timeless gift of music to be played in their adopted, but beloved, home of Southern Illinois. Art, accorting to John Hayward, is an imaginative activity that allows us to transcend our experience and through our own efforts create something original, thereby sharing in the divine power of creation. Along with music, dance, and poetry, religion is an art form, a human endeavour that at its best and most profound moments allows us a glimpse into the heart of God. The Rose Window of the First Unitarian Church of Chicago has fascinated me ever since I first saw it in 1943. Designed and made by Charles Connick of Boston, it is rightly scaled to the proportions of the church building: brilliant yet simple, dramatic, yet unpretentious. 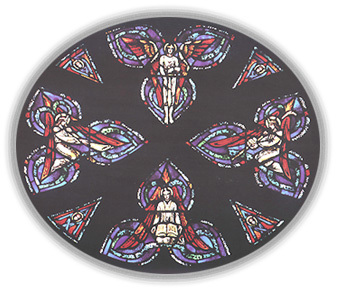 The window is divided into four trefoils, or clover-like triangles. Each trefoil contains a figure with red wings and an androgynous face, with relatively undifferentiated features. These details establish the figures as archangels. The North Angel holds a sword point down at parade rest. To me this is a symbol of the human necessity to be governed by law rather than by arbitrary force. There is no law without some kind of police authority to enforce it. We individualists who pride ourselves on being free spirits could not survive without some degree of conformity, most of it willing conformity, in order to give human life some viable order and structure. The North Angel appears to me as the Angel of Law and Order. The South Angel, whom I shall call the Angel of the Book, sits quietly and openly, an open book in its lap. We see a picture of mental observation, of study and writing, and in the open gesturing hands, an image of eloquence—all hallmarks of the thinker and teacher. The two angels, the Angel of Law and Order and the Angel of the Book, are guardians of human civilization. They also form the main axis of our free religious culture, just as they form the main axis of our window. In many ways the history of liberal religion has been the effort to educate people to harmonize the functions of the North and South Angels. However, for me religion involves something more than book learning and social action. A glance at our beautiful window and the West and East angels will tell is what that something more is. The West Angel is a musician, its instrument a trumpet. This angel is any and every artist, not only the giants of fine arts, but every professional or amateur who loves the beauty and vitality of the arts. The East Angel cradles a shepherd’s crook in one hand and arm, suggesting the pastor, or overseer of a flock of sheep; one who guards the general welfare of the flock. The East Angel, the Good Shepherd, combines all those economic and helping functions by which a people is able to live and to live well. Notice that each of the three angels East, South, and West has a tongue of flame on its head, while the North Angel does not. To me this says that human and divine love, human and divine truth, and human and divine beauty all belong in the primal creativity of our world. The North Angel, Guardian of Law and Order, has no such flame on its head. Its power derives from beyond itself, from the other three archangels; Its authority exists only as derived from the other three. The power of our window is more mystical because it is derived from the window’s colors. Red—the color of fire, the color of blood—is the color of courage. Gold is the color of wisdom and glory. Green is the color of our life-sustaining earth. 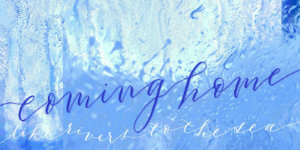 Blue is the most mystical color of all. The time will come when you and I will be beyond the clear memory and ministrations of our Rose Window angels. We shall be very much alone unless we are blessed to carry with us the memory of colors—the red, the gold, the green, and especially the blue. I may not be able to remember the forms of functions of our angels, but I would like to remember the quality of the light that shone through them. 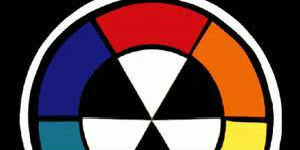 The invention of stained glass has both a factual and symbolic effect. In the factual sense, the glass polarizes the white, all-blinding, pure light into its constituent colors. In the symbolic sense, the stained glass helps us to intuit the many-colored meanings possible within our background of mystery. The human inventions and fashioning of art and myth, like the natural fibers of sunlight, make it possible for us to sing the reality of the divine. — From Through the Rose Window: Art, Myth, and the Religious Imagination, by John F. Hayward, edited by Kenneth A. Olliff (Boston: Skinner House, 2002). At the time Jack Hayward began his long, deep friendship with James Luther Adams, the ministry of Adams involved a leading role in initiating the AUA Commission on Appraisal which published its findings as Unitarians Face a New Age in 1936. That work began the Unitarian Renaissance which is celebrated here online as Notable American Unitarians, 1936-1961. Hayward, John F. Existentialism and Religious Liberalism, John F. Hayward. Boston: Beacon Press, 1962.